Minimal instructions for installing and configuring NVIDIA virtual GPU software. Virtual GPU Software Quick Start Guide provides minimal instructions for installing and configuring NVIDIA® virtual GPU software on the Citrix Hypervisor or VMware vSphere hypervisor and for installing and configuring a single-instance NVIDIA virtual GPU License Server on Windows. If you need complete instructions, are using other platforms, or require high availability for the license server, refer to Virtual GPU Software User Guide and Virtual GPU License Server User Guide . After your order for NVIDIA vGPU software is processed, you will receive an order confirmation message from NVIDIA. This message contains information that you need for getting your NVIDIA vGPU software from the NVIDIA Software Licensing Center. 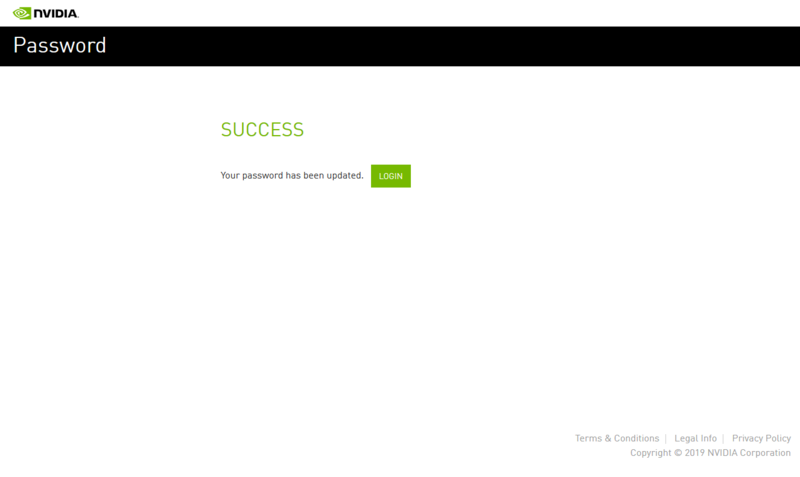 To log in to the NVIDIA Software Licensing Center, you must have an NVIDIA Enterprise Account. You have a server platform that is capable of hosting your chosen hypervisor and NVIDIA GPUs that support NVIDIA vGPU software. For a list of validated server platforms, refer to NVIDIA GRID Certified Servers. One or more NVIDIA GPUs that support NVIDIA vGPU software is installed in your server platform. A supported virtualization software stack is installed according to the instructions in the software vendor's documentation. A virtual machine (VM) running a supported Windows guest operating system (OS) is configured in your chosen hypervisor. 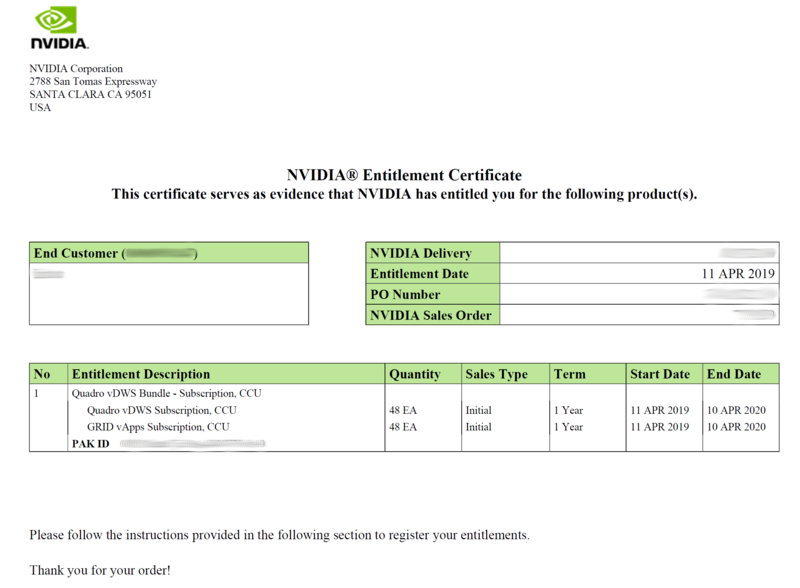 After your order for NVIDIA vGPU software is processed, you will receive an order confirmation message to which your NVIDIA Entitlement Certificate is attached. 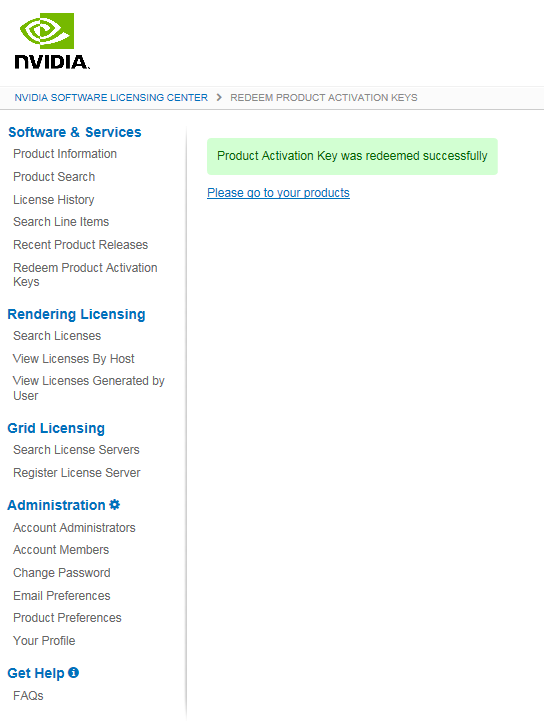 Your NVIDIA Entitlement Certificate contains your product activation keys. Your NVIDIA Entitlement Certificate also provides instructions for using the certificate. To redeem the product activation keys for your NVIDIA vGPU software, you must have an NVIDIA Enterprise Account. Note: For a Support, Upgrade, and Maintenance Subscription (SUMS) renewal, no action is required. You do not need to redeem the product activation keys for a SUMS renewal. If you do not have an account, follow the Register link in the instructions for using the certificate to create your account. For details, see Creating Your NVIDIA Enterprise Account. 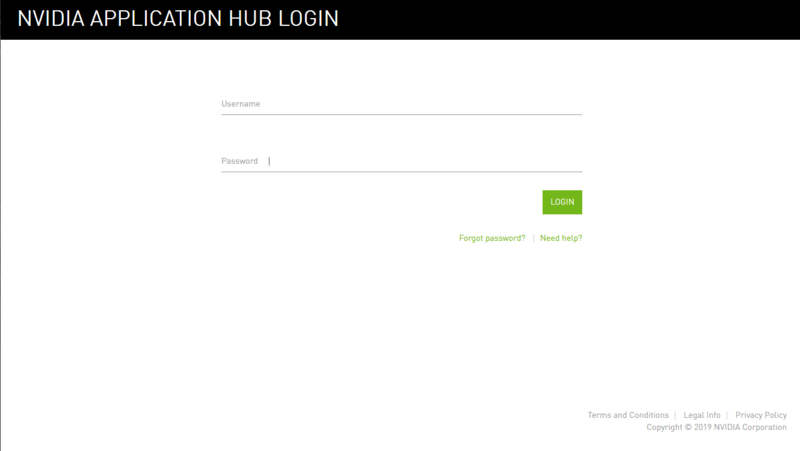 If you already have an account, follow the Login link in the instructions for using the certificate to log in to the NVIDIA Enterprise Application Hub, go to the NVIDIA Software Licensing Center, and redeem your product activation keys. 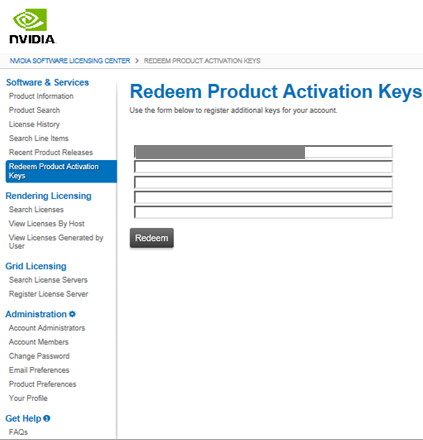 For details, see Redeeming Your Product Activation Keys and Downloading Your NVIDIA vGPU Software. If you do not have an NVIDIA Enterprise Account, you must create an account to be able to log in to the NVIDIA Software Licensing Center. Note: If you already have an account, skip this task and go to Redeeming Your Product Activation Keys and Downloading Your NVIDIA vGPU Software. Before you begin, ensure that you have your order confirmation message. 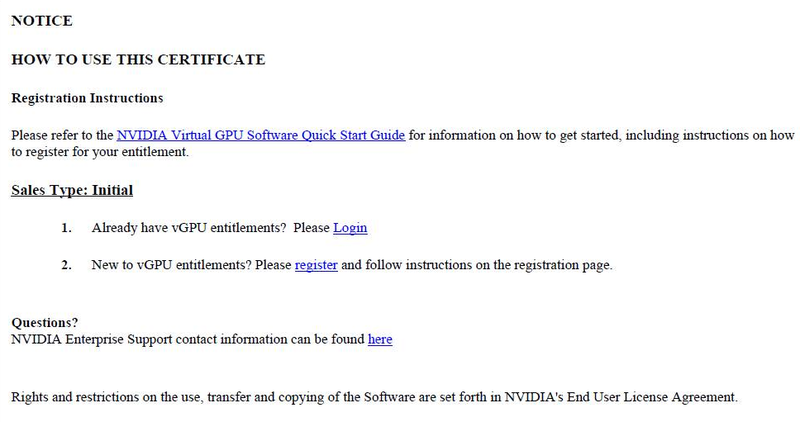 In the instructions for using your NVIDIA Entitlement Certificate, follow the Register link. 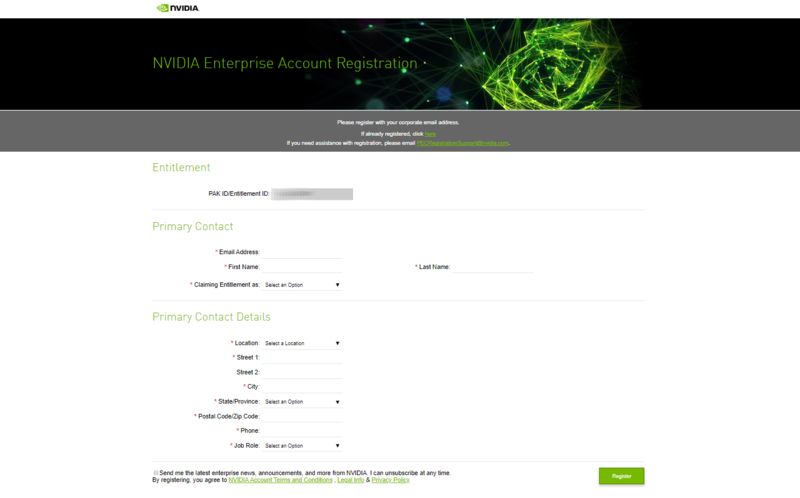 Fill out the form on the Create Your NVIDIA Enterprise Account page and click Register. 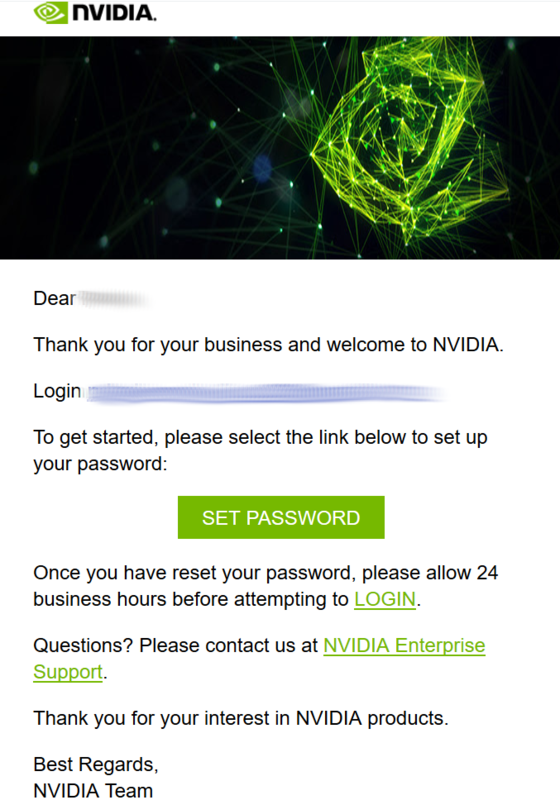 A message confirming that an account has been created appears and an e-mail instructing you to set your NVIDIA password is sent to the e-mail address you provided. Open the e-mail instructing you to set your password and click SET PASSWORD. For your account security, the SET PASSWORD link in this e-mail is set to expire in 24 hours. Enter and re-enter your new password, and click SUBMIT. A message confirming that your password has been set successfully appears. 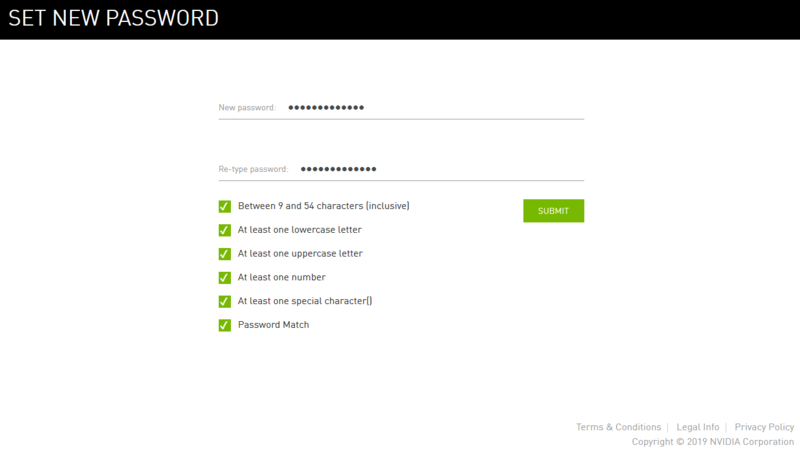 You are then automatically directed to log in to the NVIDIA Software Licensing Center with your new password. Before you begin, ensure that you have your order confirmation message and have created an NVIDIA Enterprise Account. Visit the NVIDIA Software Licensing Center by following the Login link in the instructions for using your NVIDIA Entitlement Certificate. When prompted, provide your e-mail address and password, and click LOGIN. If the page is already populated with your product activation keys, click Redeem. Otherwise, enter each product activation key in a separate text field and click Redeem. 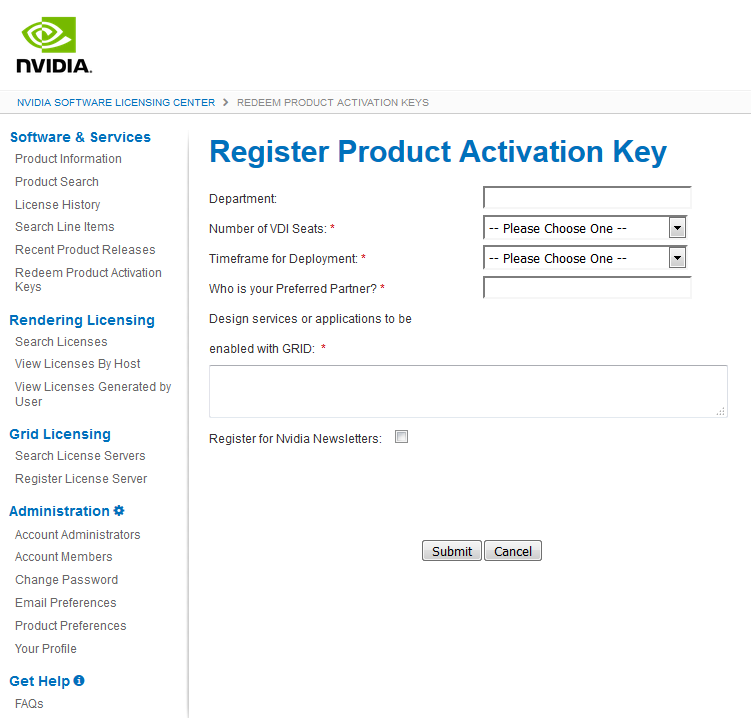 On the Register Product Activation Key page that opens, provide the requested information about how you intend to use NVIDIA vGPU software and click Submit. On the confirmation page that opens, follow the Please go to your products link. The Product Information page opens with the Current Releases tab selected. Older versions of NVIDIA vGPU software are available from the Archived Versions tab. On the Product Information page, follow the NVIDIA Virtual GPU Software link. 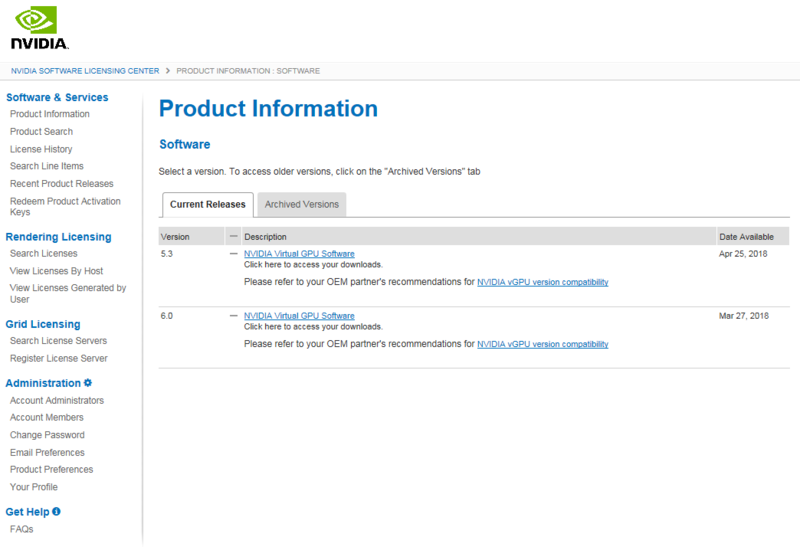 On the Product Download page that opens, follow the links to download the software that you require. 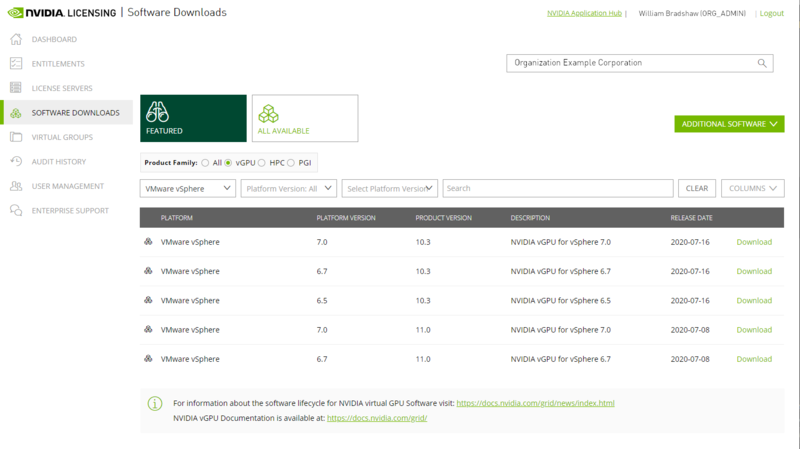 Follow the link to the NVIDIA vGPU software download for the brand and version of your chosen hypervisor, for example, NVIDIA vGPU for vSphere 6.5. Follow the link to the NVIDIA vGPU software license server software for your license server host machine’s operating system, for example, License Manager for Windows. If you are using an NVIDIA Tesla™ M60 or M6 GPU and think you might need to change its mode, follow the Mode Change Utility link. For details about when you need to change the mode, see Switching the Mode of a Tesla M60 or M6 GPU. 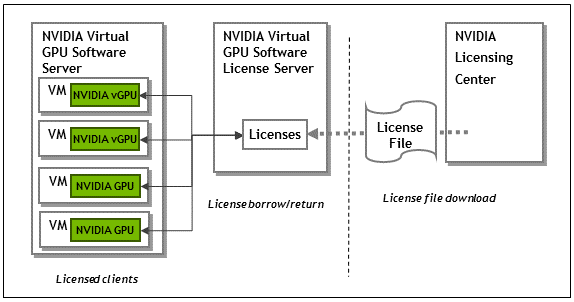 The NVIDIA vGPU software License Server is used to serve a pool of floating licenses to NVIDIA vGPU software licensed products. The License Server is designed to be installed locally within a customer’s network, and be configured with licenses obtained from the NVIDIA Software Licensing Center. Note: These instructions cover only the installation and configuration of a single-instance license server. If you require high availability for the license server, refer to Virtual GPU License Server User Guide for instrictions for how to configure a primary and secondary license server. If you do not register a secondary server when the primary server is registered, you cannot register the secondary server later. NVIDIA vGPU software is a licensed product. Licensed vGPU functionalities are activated during guest OS boot by the acquisition of a software license served over the network from an NVIDIA vGPU software license server. The license is returned to the license server when the guest OS shuts down. The licenses served by the NVIDIA vGPU software license server are obtained from the NVIDIA Software Licensing Center as downloadable license files, and installed into the license server through its management interface. The platform must have a fixed (unchanging) IP address. The IP address may be assigned dynamically by DHCP or statically configured, but must be constant. The platform must have at least one unchanging Ethernet MAC address, to be used as a unique identifier when registering the server and generating licenses in the NVIDIA Software Licensing Center. The platform’s date and time must be set accurately. NTP is recommended. If a suitable 32-bit Java version is not already installed on your system, download the current 32-bit Java runtime environment from the java.com: Java + You website and install it before running the NVIDIA license server installer. 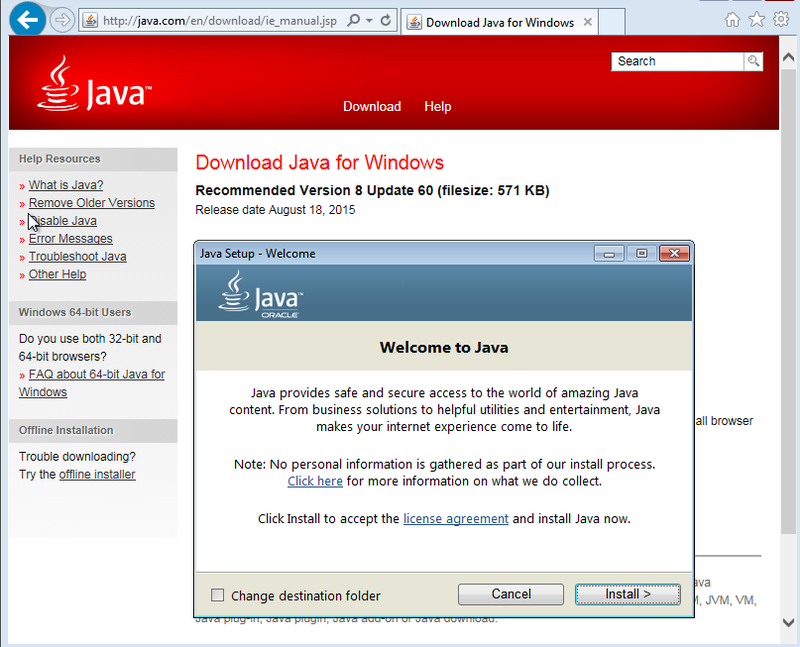 Note: Install the 32-bit Java runtime, regardless of whether your platform is 32-bit Windows or 64-bit Windows. If a 64-bit Java runtime is already installed, remove it before installing the 32-bit version to ensure that future updates to the Java software can be applied correctly. Unzip the license server installer and run setup.exe. Accept the EULA for the license server software and the Apache Tomcat software used to support the license server’s management interface. Choose the destination folder where you want the license server software to be installed. 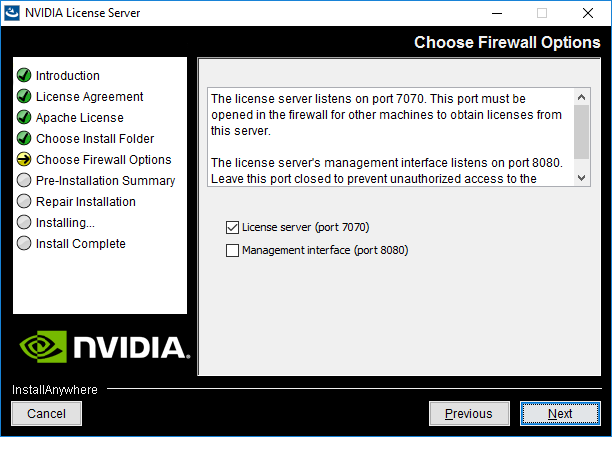 In the Choose Firewall Options dialog box, select the ports to be opened in the firewall. Port 7070 is open to enable remote clients to access licenses from the server. Port 8080 is closed to ensure that the management interface is available only through a web browser running locally on the license server host. After installation has completed successfully, click Done to exit the installer. The license server’s Ethernet MAC address uniquely identifies your server to the NVIDIA Software Licensing Center. You will need this address to register your license server with the NVIDIA Software Licensing Center to generate license files. Open a web browser on the license server host and connect to the URL http://localhost:8080/licserver. In the license server management interface, select Configuration. On the License Server Configuration page that opens, in the Server host ID drop-down list, select the platform’s ETHERNET address. 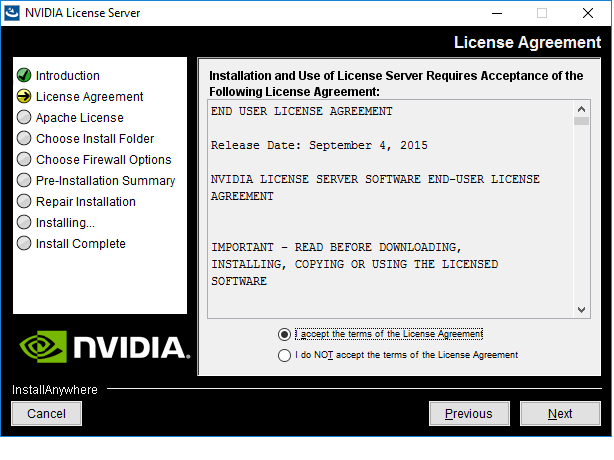 To be able to generate and download licenses from the NVIDIA Software Licensing Center, you must register your license server. Before downloading a license file, you must generate the file by mapping to it the add-ons that correspond to your licenses. The license file is empty by default and does not contain any licenses it until you map add-ons to it. Note: If you require high availability for the license server, you must register a secondary server when the primary server is registered. If you do not register a secondary server when the primary server is registered, you cannot register the secondary server later. For information about high availability for the license server, refer to Virtual GPU License Server User Guide . If you are not already logged in, log in to the NVIDIA Enterprise Application Hub and click NVIDIA LICENSING PORTAL to go to the NVIDIA Software Licensing Center. 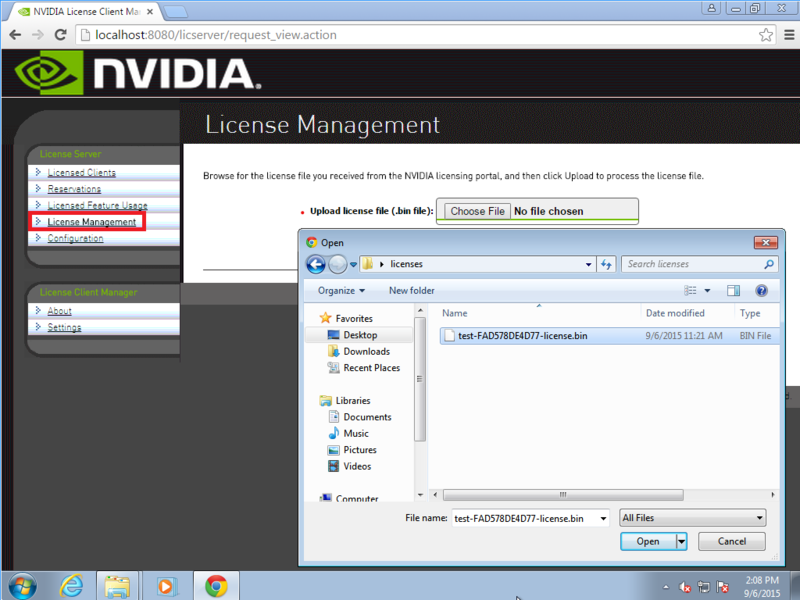 In the navigation pane of the NVIDIA Software Licensing Center page, under GRID Licensing, select Register License Server. 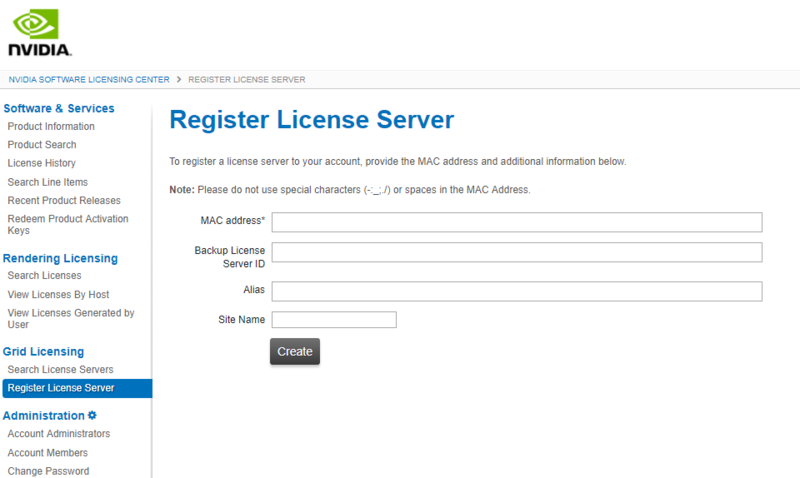 On the Register License Server page that opens, provide the details of your license server. In the MAC Address field, enter the MAC address of your license server. Enter only the numbers and letters in the address. Do not enter any spaces or punctuation. Leave the Backup License Server ID field unset. Optional: Provide an alias and site name for your license server. If you do not provide an alias, it is set to the MAC address of your license server. You can edit the alias after your license server is registered. If you do not provide a site name, your license server is registered without a site name. You cannot add a site name after your license server is registered. On the View Server page that opens, follow the Map Add-Ons link. On the Map Add-Ons page that opens, in the Qty to add field, enter the number of licenses you want to add to your license file and click Map Add-Ons. You can also configure and register multiple servers and distribute your NVIDIA vGPU software licenses across them by mapping add-ons to servers as necessary. After clicking Map Add-Ons, you are returned to the View Server page. Back on the View Server page, follow the Download License File link and save the .bin license file to your license server for installation. Note: The .bin license file is valid for 72 hours. If you do not install the file within 72 hours of downloading it, you must download it again. NVIDIA vGPU software licenses are distributed as .bin files for download from the NVIDIA Software Licensing Center. Before installing a license, ensure that you have downloaded the license file from the NVIDIA Software Licensing Center. In the license server management interface, select License Management. On the License Management page that opens, click Choose File. In the file browser that opens, select the .bin file and click Open. Back on the License Management page, click Upload to install the license file on the license server. The license server should confirm successful installation of the license file. Before installing and configuring NVIDIA vGPU Manager and the Guest Driver, ensure that a VM running a supported Windows guest OS is configured in your chosen hypervisor. The factory settings of some supported GPU boards are incompatible with NVIDIA vGPU software. Before configuring NVIDIA vGPU software on these GPU boards, you must configure the boards to change these settings. Tesla M60 and M6 GPUs support compute mode and graphics mode. NVIDIA vGPU requires GPUs that support both modes to operate in graphics mode. Note: Only Tesla M60 and M6 GPUs require and support mode switching. Other GPUs that support NVIDIA vGPU do not require or support mode switching. Recent Tesla M60 GPUs and M6 GPUs are supplied in graphics mode. However, your GPU might be in compute mode if it is an older Tesla M60 GPU or M6 GPU, or if its mode has previously been changed. If your GPU supports both modes but is in compute mode, you must use the gpumodeswitch tool to change the mode of the GPU to graphics mode. If you are unsure which mode your GPU is in, use the gpumodeswitch tool to find out the mode. For more information, see gpumodeswitch User Guide . Before guests enabled for NVIDIA vGPU can be configured, the NVIDIA Virtual GPU Manager must be installed in your chosen hypervisor. The process for installing the NVIDIA Virtual GPU Manager depends on the hypervisor that you are using. If you need more detailed instructions, refer to the appropriate NVIDIA vGPU installation guide. The NVIDIA Virtual GPU Manager for VMware vSphere ESXi is distributed as a vSphere Installation Bundle (VIB) file. 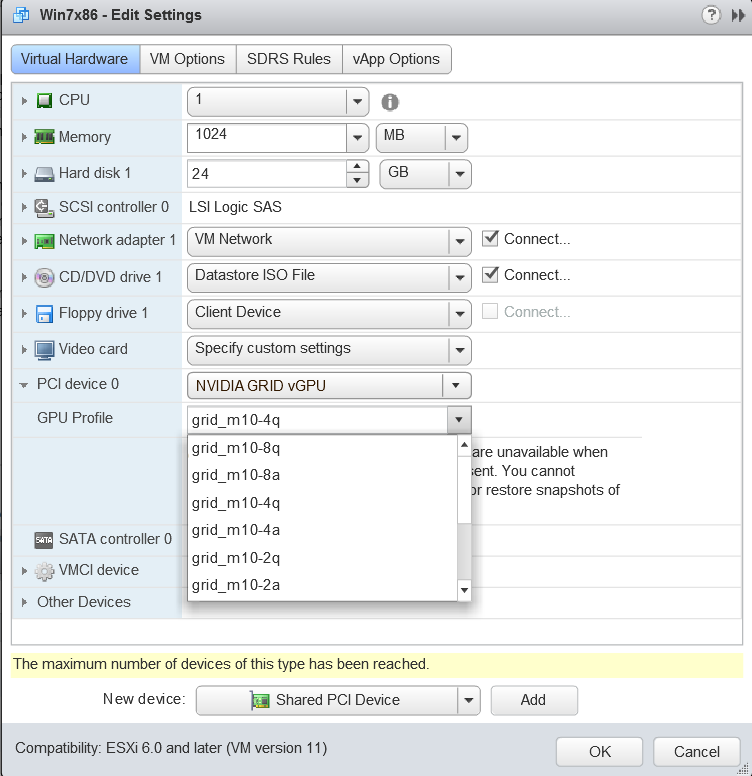 Copy the NVIDIA Virtual GPU Manager VIB file to the ESXi host. Put the ESXi host into maintenance mode. Run the esxcli command to install the NVIDIA Virtual GPU Manager from the VIB file. directory is the path to the directory that contains the VIB file. Verify that the NVIDIA kernel driver can successfully communicate with the physical GPUs in your system by running the nvidia-smi command without any options. If successful, the nvidia-smi command lists all the GPUs in your system. The NVIDIA Virtual GPU Manager for Citrix Hypervisor is distributed as an RPM Package Manager (RPM) file. It runs in the Citrix Hypervisor Control Domain (dom0) shell. Copy the NVIDIA Virtual GPU Manager RPM file to the Citrix Hypervisor dom0 shell. Run the rpm command to install the package. Reboot the Citrix Hypervisor platform. After the Citrix Hypervisor host has rebooted, verify the installation of the NVIDIA Virtual GPU Manager package for Citrix Hypervisor by checking for the NVIDIA kernel driver in the list of kernel-loaded modules. Tesla M60, Tesla M6, and GPUs based on the Pascal GPU architecture, for example Tesla P100 or Tesla P4, support error correcting code (ECC) memory for improved data integrity. Tesla M60 and M6 GPUs in graphics mode are supplied with ECC memory disabled by default, but it may subsequently be enabled using nvidia-smi. GPUs based on the Pascal GPU architecture are supplied with ECC memory enabled. However, NVIDIA vGPU does not support ECC memory. If ECC memory is enabled, NVIDIA vGPU fails to start. Therefore, you must ensure that ECC memory is disabled on all GPUs if you are using NVIDIA vGPU. Before you begin, ensure that NVIDIA Virtual GPU Manager is installed on your hypervisor. Use nvidia-smi to list the status of all GPUs, and check for ECC noted as enabled on GPUs. Change the ECC status to off on each GPU for which ECC is enabled. id is the index of the GPU as reported by nvidia-smi. This example disables ECC for the GPU with index 0000:02:00.0. Confirm that ECC is now disabled for the GPU. To attach an NVIDIA vGPU profile to a virtual machine (VM), you must configure the VM hardware. The process for attaching an NVIDIA vGPU profile to a VM depends on the hypervisor that you are using. Output from the VM console in the VMware vSphere Web Client is not available for VMs that are running vGPU. Make sure that you have installed an alternate means of accessing the VM (such as VMware Horizon or a VNC server) before you configure vGPU. VM console in vSphere Web Client will become active again once the vGPU parameters are removed from the VM’s configuration. Open the vCenter Web UI. In the vCenter Web UI, right-click the VM and choose Edit Settings. Click the Virtual Hardware tab. In the New device list, select Shared PCI Device and click Add. The PCI device field should be auto-populated with NVIDIA GRID vGPU. 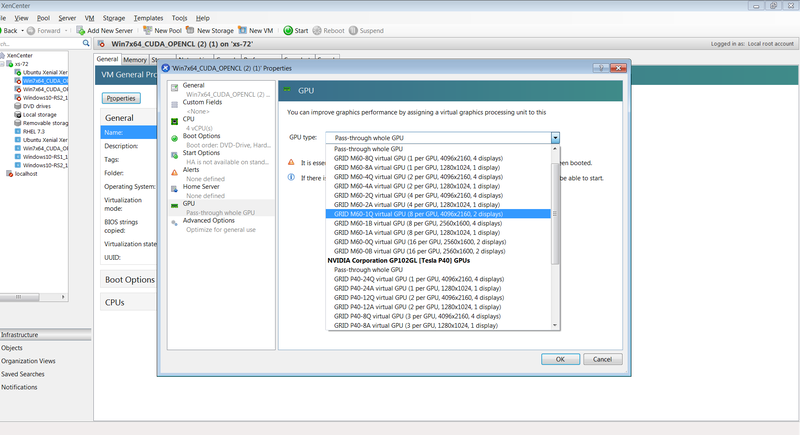 From the GPU Profile drop-down menu, choose the type of vGPU you want to configure and click OK. Select Edit virtual machine settings from the vCenter Web UI. Expand the Memory section and click Reserve all guest memory (All locked). After you have configured a vSphere VM with a vGPU, start the VM. VM console in vSphere Web Client is not supported in this vGPU release. Therefore, use VMware Horizon or VNC to access the VM’s desktop. Ensure the VM is powered off. After you have configured a Citrix Hypervisor VM with a vGPU, start the VM, either from XenCenter or by using xe vm-start in a dom0 shell. You can view the VM’s console in XenCenter. After you create a Windows VM on the hypervisor and boot the VM, the VM should boot to a standard Windows desktop in VGA mode at 800×600 resolution. You can use the Windows screen resolution control panel to increase the resolution to other standard resolutions, but to fully enable GPU operation, the NVIDIA vGPU software graphics driver must be installed. 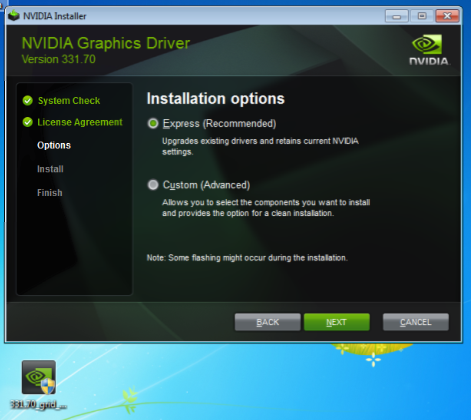 Copy the NVIDIA Windows driver package to the guest VM where you are installing the driver. Execute the package to unpack and run the driver installer. Click through the license agreement. Select Express Installation and click NEXT. After the driver installation is complete, the installer may prompt you to restart the platform. Select Restart Now to reboot the VM. Exit the installer and reboot the VM when you are ready. After the VM restarts, it boots to a Windows desktop. Verify that the NVIDIA driver is running. From the menu that opens, choose NVIDIA Control Panel. In the NVIDIA Control Panel, from the Help menu, choose System Information. NVIDIA Control Panel reports the vGPU that is being used, its capabilities, and the NVIDIA driver version that is loaded. Perform this task from the guest VM to which the vGPU is assigned. The NVIDIA Control Panel tool that you use to perform this task detects that a vGPU is assigned to the VM and, therefore, provides no options for selecting the license type. After you license the vGPU, NVIDIA vGPU software automatically selects the correct type of license based on the vGPU type. Note: These instructions cover only licensing for a single-instance license server. If you configured a primary and secondary license server, refer to Virtual GPU Client Licensing User Guide for instructions for how to specify the address and port number of the primary and secondary license servers. 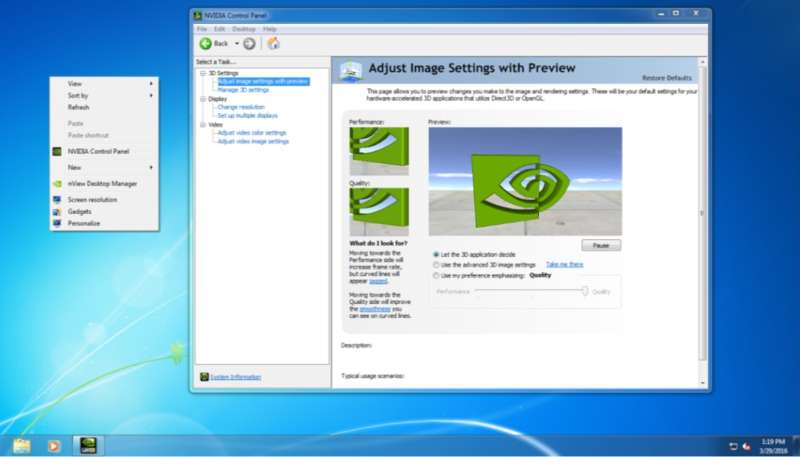 Right-click on the Windows desktop and select NVIDIA Control Panel from the menu. Open Windows Control Panel and double-click the NVIDIA Control Panel icon. 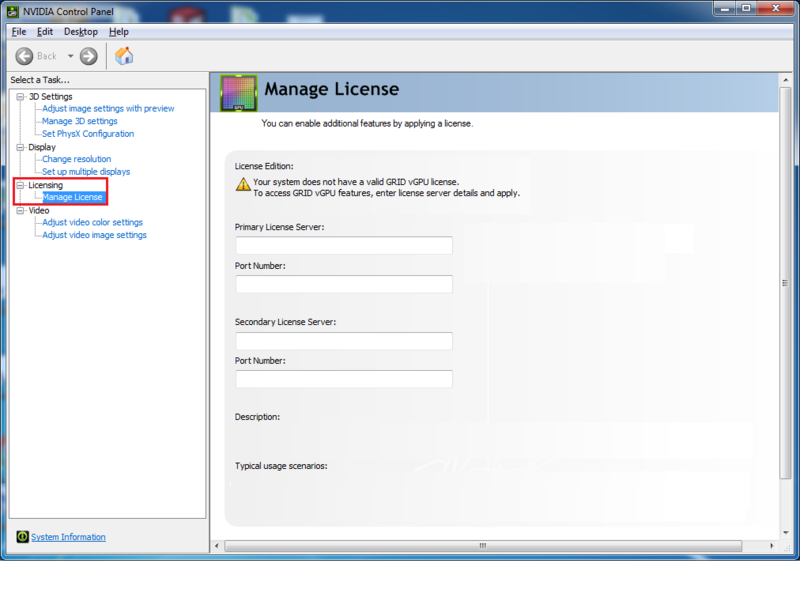 In NVIDIA Control Panel, select the Manage License task in the Licensing section of the navigation pane. Note: If the Licensing section and Manage License task are not displayed in NVIDIA Control Panel, the system has been configured to hide licensing controls in NVIDIA Control Panel. For information about registry settings, see Virtual GPU Client Licensing User Guide . The Manage License task pane shows that NVIDIA vGPU is currently unlicensed. In the Primary License Server field, enter the address of your NVIDIA vGPU software License Server. The address can be a fully-qualified domain name such as gridlicense1.example.com, or an IP address such as 10.31.20.45. Leave the Port Number field under the Primary License Server field unset. The port defaults to 7070, which is the default port number used by NVIDIA vGPU software License Server. Leave the Secondary License Server field and the Port Number field under it unset. Click Apply to assign the settings. The system requests the appropriate license for the current vGPU from the configured license server. The vGPU within the VM should now exhibit full frame rate, resolution, and display output capabilities. The VM is now capable of running the full range of DirectX and OpenGL graphics applications. You have now completed the process of installing NVIDIA vGPU software and setting up a single VM to use NVIDIA vGPU. If the system fails to obtain a license, see Virtual GPU Client Licensing User Guide for guidance on troubleshooting. HDMI, the HDMI logo, and High-Definition Multimedia Interface are trademarks or registered trademarks of HDMI Licensing LLC. OpenCL is a trademark of Apple Inc. used under license to the Khronos Group Inc.
NVIDIA, the NVIDIA logo, NVIDIA GRID, vGPU, Pascal, Quadro, and Tesla are trademarks or registered trademarks of NVIDIA Corporation in the U.S. and other countries. Other company and product names may be trademarks of the respective companies with which they are associated. © 2013-2019 NVIDIA Corporation. All rights reserved.